Cherryland Electric Cooperative’s community solar array just outside Traverse City sold all of its shares in about a year. Courtesy photo. On the property of Cherryland Electric Cooperative in northern Michigan’s Grand Traverse County, a model for bringing solar power to those who may not have the location for it recently celebrated its first birthday. Cherryland’s Solar Up North (SUN) Alliance Community Solar Project, the first such project in the state when it launched on Earth Day last year, is a relatively modest 224-panel solar array. But it could serve as the catalyst to set renewable energy groups, utilities and the state on a path to find out how the industry can be expanded in Michigan, a state that clean energy advocates say is lacking in solar development. “It’s more of a lifestyle statement,” said Tony Anderson, general manager of Cherryland, the co-op that has partnered with the municipal Traverse City Light and Power on the project. In its first year, the project sold out of all 224 panels and others are on a waiting list. Cherryland is exploring options for a second phase. The project has also succeeded despite the lack of formal state policy, incentives, research assistance or grant money. “It was two utilities that said, ‘Let’s get something done,’” Anderson said. The SUN project came together in October 2012 when Anderson met with Tim Arends, executive director of Traverse City Light and Power. Anderson also highlights the fact that shares in the program are below $500 a panel, and below $400 with an energy optimization rebate. The project is made up of mostly residential customers buying a single panel, Anderson said. The energy produced is net-metered into the nearby Cherryland office building. Participating customers receive a bill credit for the energy produced each month. Customers have access to power generated by the panel for 25 years. According to the Great Lakes Renewable Energy Association, the expected returns are roughly $24 a year, with a payback in just fewer than 20 years. “I’m proud for it to be as simple as possible so as not to burden the customer or the utility,” Anderson said. 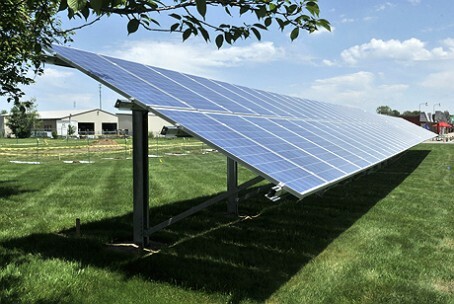 Since launching, at least one other Michigan co-op has started its own community solar project, while another municipal utility, the Lansing Board of Water and Light, intends to issue a request for proposals to expand its solar offerings, likely including a community solar project. Michigan does not have laws related to community solar projects on the books. It is easier for co-ops and, to a lesser extent, municipal utilities, to pursue such projects because the Michigan Public Service Commission does not regulate them the same way it does investor-owned utilities. Still, state officials say they encourage the projects. The Great Lakes Renewable Energy Association, through a grant from the Michigan Energy Office, has prepared a guidebook for interested parties, whether they are companies, nonprofits, units of government or utilities. But with only two projects off the ground, it’s fair to say community-solar development is still in its infancy – in an information-gathering phase. Tania Howard, renewable energy program manager for the Michigan Energy Office (a unit of the Michigan Economic Development Corp.), said anyone can launch a community solar program, but that “it’s certainly easier if they participate with a utility.” Investor-owned utilities would need approval from the Michigan Public Service Commission. Indeed, the solar guidebook outlines four different business models, which include buying power from a “solar farm” or buying or leasing panels at a farm. All models fall under the thinking that it allows people who may not have a good site or the money to install their own system to launch one cooperatively. Michigan lags behind states in terms of legislating community solar farms. Last year, Minnesota Gov. Mark Dayton signed a community solar garden law that mandated one major utility, Xcel Energy, to come up with a plan for solar gardens. In Colorado, investor-owned utilities are required to provide rebates for community solar projects. And the Great Lakes Renewable Energy Association’s guidebook shows Colorado leading the nation with community solar projects, tracking nine of them as of February. The group lists a total of 33 projects in 14 states as of February. While there is no legislation directly related to community solar in Michigan, supporters point to a state “crowdfunding” law signed last year that creates an avenue for groups of people to raise money for a project while avoiding U.S. Securities and Exchange Commission regulations. The intention was to help small business development, which solar advocates say includes them. Also, a solar working group convened earlier this year by the Michigan Public Service Commission, is reviewing ways in which the two major investor-owned utilities – DTE and Consumers Energy – might expand or improve their solar offerings. One committee of the group looked specifically at community solar. A uniform policy, solar advocates say, will provide a framework for more projects to flourish. John Sarver, a board member and former executive director of the Great Lakes Renewable Energy Association, said his organization in December 2012 started looking at a community-solar initiative, separate of what Cherryland had planned. Community solar, Sarver said, is conceived as yet another way to expand renewable energy generation, even if it only makes up a minute percentage of the overall portfolio. “It gives people an opportunity to participate in moving this change ahead,” he said. GLREA’s solar guidebook, which was updated in February, lists 33 community solar projects that have launched throughout the country. The guidebook also says that solar capacity from these projects across the country quadrupled between August 2012 and September 2013, from 10 MW to nearly 40 MW. Anderson, of Cherryland, said he has “frustration as a utility guy” that there appears to be merely talk – and surveying – about whether the public wants and is willing to pay for community solar projects. That it took him a year to sell 224 shares may suggest otherwise, he said. “I don’t think the public is as excited about solar as some people want us to believe,” Anderson said. However, these groups and state officials point to more evidence that public demand is growing. The two large investor-owned utilities in Michigan, DTE and Consumers Energy, had to resort to a lottery system to choose customers to participate in their solar pilot programs. And the Sierra Club of Michigan recently released public polling results showing customers would have a more favorable opinion of utilities if they knew the utility was investing in solar. The city of East Lansing, home to Michigan State University, is surveying the community about a potential solar project. HomeWorks Tri-County Electric Cooperative in mid-Michigan, hosting the state’s second community solar project since it launched in April, says customer interest is growing. The co-op has started promoting it among members, “though not heavily yet,” spokeswoman Jayne Graham said. The project has 76 panels on one array and there is room for three more arrays. Sarver, of GLREA, says Michigan is still finding its footing as a solar-friendly state. This story first appeared on Midwest Energy News on May 27.